Those of you who read my last post know that our theme for my son’s party this year was rock climbing. 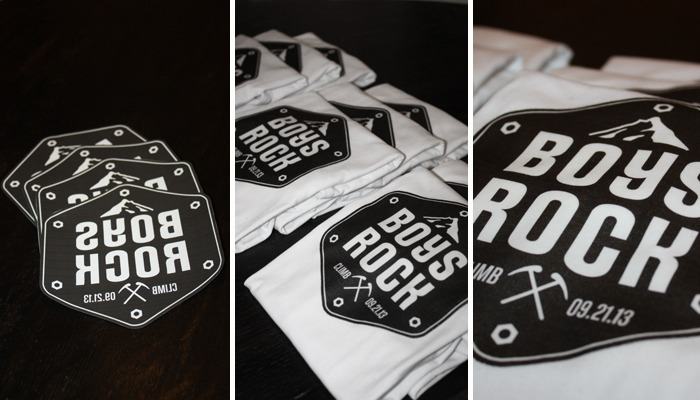 I wanted to make the boys a keepsake to remember the day by, so I used the logo I had previously designed for the invitations and made t-shirts out of them. 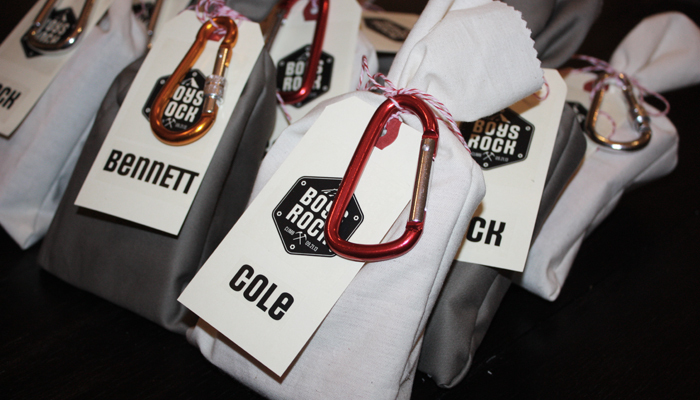 For the loot bags I used scrap pieces of fabric and added rock climbing touches. The kids loved the t-shirts and my homemade gorp! First you need to design your t-shirt. You could use a photograph, draw it by hand and scan it in or design something on your computer. You need to have a file you can print off of your ink jet printer. (Thanks Deirdre for letting us use your pool and printer!) 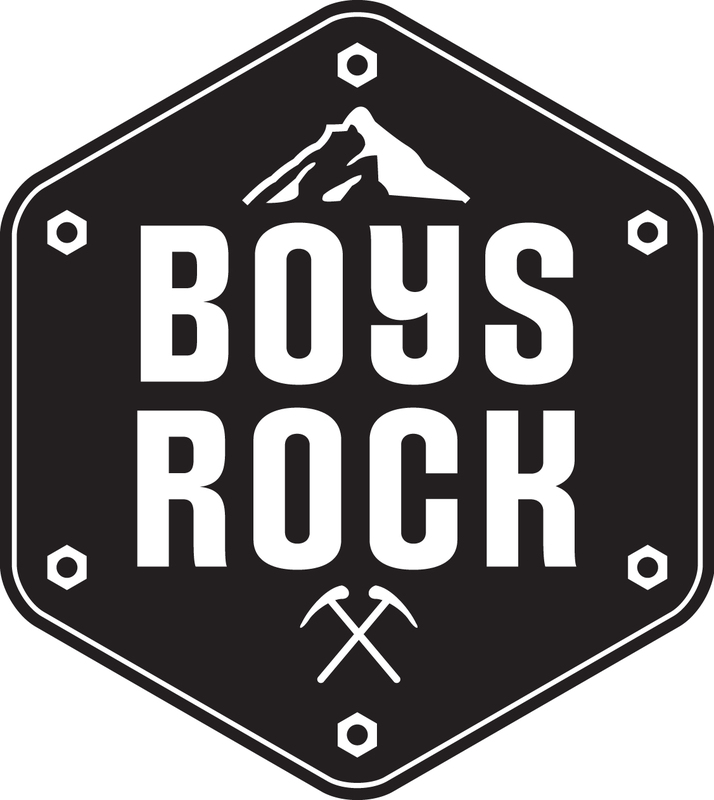 If you like the icon I created, you can download it here: BOYSROCK_LOGO (I included a “girls rock” icon as well that I used for my daughters t-shirt). Make sure that, whatever you design, you print it backwards on the transfer paper, see above photo. Otherwise you will have a mirrored image once you iron it on. Next, carefully cut out your emblem, I cut as close to the outside black key line as possible (otherwise anywhere not printed on is a bit shiny). Turn on your iron to the hottest cotton selection, making sure the steam is off. See instructions for the length of time, but I ironed mine for 1.5 minutes each. Let it cool a bit then peel off the backing paper and voila; fantastic customized shirts! Please see previous post Rock Climbing Invitation. The size of the bag depends on the loot you are going to include. My items were fairly small so I was able to get 10 bags out about a yard of fabric. Loosely measure items to determine size, fold fabric so that the bottom of the bag will fall along the fold. Cut out the bags and use your pinking shears to cut the top edge (no extra finishing will be required then). Sew up the two sides and you’re done. Total time: approximately half an hour. 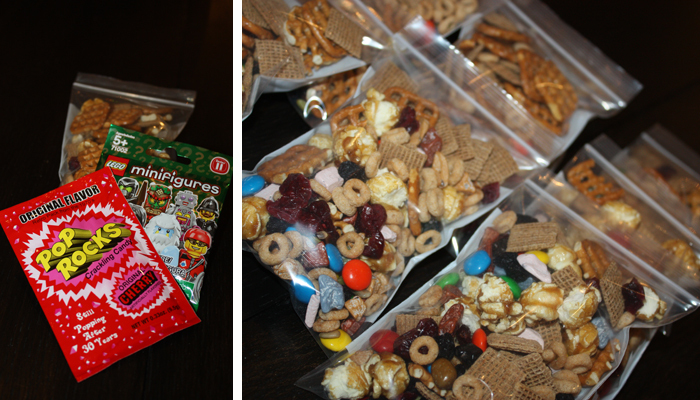 I made small bags of gorp (healthy snacks often used by hikers) to go in each bag. I went to the Bulk Barn and found some fantastic rocks that were made out of chocolate, I then added Cheerios, Shreddies, pretzels, sunflower seeds, dried cranberry’s and blueberries, caramel pop corn and M&Ms. I placed my gorp in clear plastic bags. I was then ready to assemble the bags. 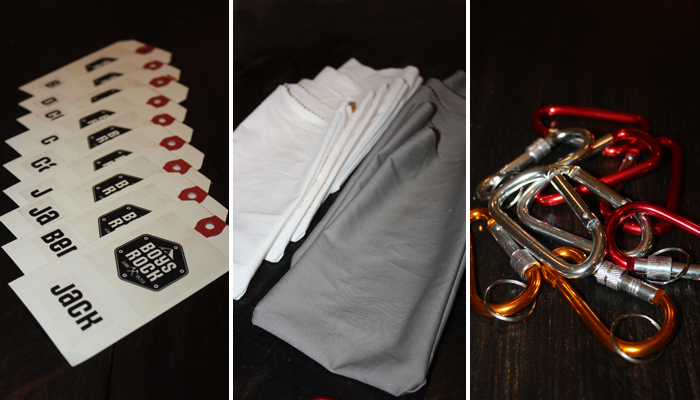 After inserting the items, I tied each bag with bakers twine (you can use yarn) and attach a name tag and a carabiners ring. I was very pleased with how great they turned out. Janet is a graphic designer by trade, so if you’d like to commission her to create a design for you, perhaps you can contact her about her rates.